The new generation of portable precision glossmeters for the determination of all gloss ranges. They are intelligent, this starts with the calibration, goes on over the whole measuring procedure up to the examination of the results. Small in the dimensions, this lightweight glossmeter is able to measure on very confined areas, curved surfaces and surfaces that are not uniform. Available as single, dual and triple angle versions; several geometries and measuring heads can be operated at the same time. Easy control, operation and display with the “GlossTools” software directly on a PC or laptop, even the power supply operates via the USB-interface. Modern, sturdy alu-design and high quality. The ZGM 1120 series glossmeters are connectable to a PC or laptop by use of a USB-interface. 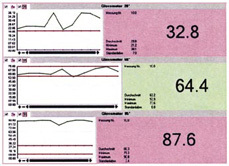 It is possible to operate and control several geometries and measuring heads with the “GlossTools” software at the same time. Single measurements, multi measurements, specially designed automated series of measurements according to user specifications as well as continuous measurements are available. On-going updated statistics of the gloss values (average, standard deviation, max, min) can be obtained. The “mini” covers all established functions for the demanding requirements of the production and laboratory. Furthermore, it is possible to set limit values and reference values for gloss range measurements. The “GlossTools” software enables an easy transfer of the measuring data to in-house databases or processing in Microsoft Excel. Due to the automatic standard recognition, the calibration is once again easier. Besides the small dimensions, this lightweight glossmeter is characterized by its modern and sturdy alu-design. 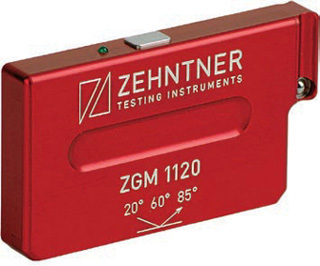 The ZGM 1120 glossmeters measure to all common standards and are available for any application from mat to high-gloss for all industries and especially for measurements on very confined areas, curved surfaces and surfaces that are not uniform, using single, dual or triple angle measuring heads. In cases where the curvature is problematic or extreme the "R" version of the dual or triple angle glossmeter is needed. This requires custom, made to order, R Angle fitting of the instrument derived from submitted samples.